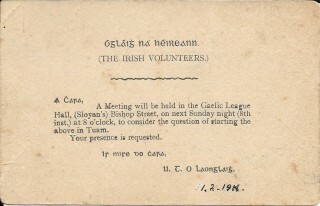 Liam Langley, NA Fianna Éireann & IRB, sent out the notice for the inaugural meeting of The Irish Volunteers in Tuam. the Irish form of his name is used. The following is an extract from ‘The Irish Volunteer’ of 21 February 1914. An account of the above meeting is recorded in this extract. 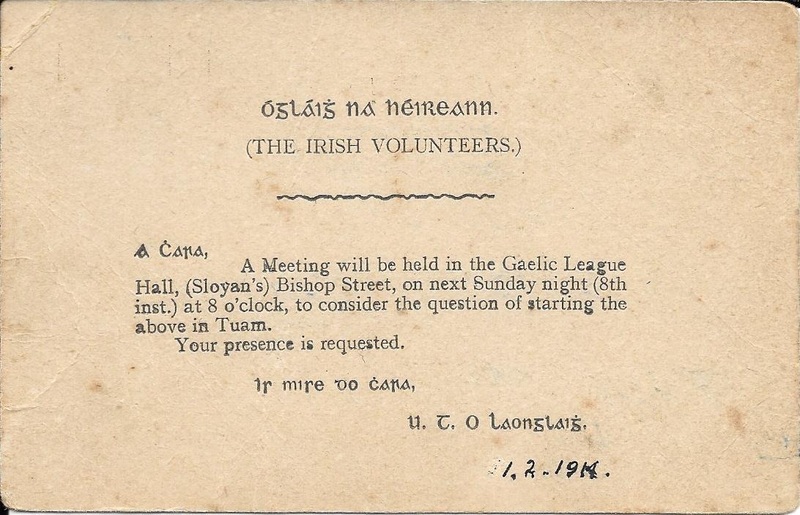 “At a Volunteer meeting held on Sunday, 8th February 1914, the following were present: Messrs Butler, Stafford, O’Malley, Nolan, and Walsh, representing the A.O.H., Messrs Burke, Stockwell and Fahy, representing the I.N.F. ; Messrs Hare, Browne and Creedon, the G.A.A. ; Mr T. Sloyan, The U.I.L., and Messrs P. Daly and W. Langley, Na Fianna Eireann; Dr. T. B. Costello, Messrs McHugh, Donnellan, Cannon, Mullins, Roche, Kennedy, Forde & co.
Dr Costello presided and explained the business of the meeting. Mr. Sloyan, the Secretary of the North Galway U.I.L. said that the League would back the movement to a man, and he added that he was sure the same spirit was abroad in Ireland today as that which fought in Clontarf, at the Yellow Ford and on the field of Fontenoy and which started the Volunteer movement in 1782, and he urged them to go ahead in Tuam and fall in with their rest of their countrymen.